DEMEYRE SAYS MAKING SURE EVERYONE KNOWS WHAT'S EXPECTED OF THEM - AND WHAT'S NOT EXPECTED OF THEM - NEEDS TO BE THE FIRST STEP AT THE START OF THE SEASON. ACCORDING TO MIKE Demeyre, “no data is better than bad data.” That’s why he makes sure that everything is uniform in his research fields — from seed bed, to fertilizer application, to the uniformity of the soil. Demeyre is the research operations leader for Dow DuPont’s Woodstock location (DowDuPont will be known as Corteva AgroSciences next year). He has been involved in field research of corn, soybeans, and wheat for more than 30 years. During that time, he has learned that good management leads to good data, which in turn leads to successful breeding and field programs. That management includes successfully dealing with both people and equipment. When it comes to people, Demeyre says making sure everyone knows what’s expected of them — and what’s not expected of them — needs to be the first step at the start of the season. For Demeyre, this applies to his staff as well as any farmer cooperators that they may be involved with. “You should set expectations and let them know why you are doing something and why it’s important to do it in a specific way, not just how they are supposed to do it,” says Demeyre. He says that’s something easy that farmers can do themselves if they hire in someone new to work on their operation, particularly if they are inexperienced, are used to doing the work a different way for someone else, or have worked on different equipment. Demeyre also tries to keep his staff motivated by celebrating key milestones such as when they meet a deadline for shipping or finish planting. They don’t do anything elaborate, typically just a pizza lunch or some other small celebration, but it builds a sense of teamwork and acknowledges the contribution everyone has made to achieving a specific goal. When it comes to field research, equipment management plays a significant role in Demeyre’s ability to obtain quality results. His team works with specialized equipment, such as a computerized planter, and if it goes down, Demeyre says it basically becomes a giant paperweight because they have to wait for specific components and a specialist to make repairs. That’s why preventative maintenance is key to make sure equipment is working properly and stays in good working order. Most farmers likely follow that same principle, but Demeyre also reminds farmers to have spare parts on hand to minimize downtime because “nothing breaks down on a rainy day”. In particular, have spares for the parts that you know are problematic. Regular maintenance and calibration of equipment is also important. “You want to make sure equipment is calibrated whether planting or harvesting to make sure you are maximizing your yield potential,” says Demeyre. Part of that comes from familiarizing yourself with the recommended settings and maintenance schedule of any new equipment you get on your farm. And once you start checking your chains and greasing your sprockets, it’s important to note down what work you do when. Record keeping is also important to double check your yield results. For Demeyre, new technology has added updating software to his list of maintenance jobs. He says he always updates to the latest version of software to take advantage of the additional capabilities being offered — but he always keeps a copy of the old version just in case. Precision agriculture has been really beneficial to his work with research plots. He keeps track of close to 100,000 corn plots in a single year and technology helps him manage the data he collects. Technology helps to remove some of the risks of errors, but there is still a lot of manual input involved. That goes back to the importance of staff training and making sure everyone knows how to perform their tasks. “Errors if caught when they happen can save a project from failure,” says Demeyre. This article is part of a series which highlights lessons from the 2018 Technician Training workshop which may benefit farmer-members involved with on-farm research or those interested in doing some of their own field experiments. 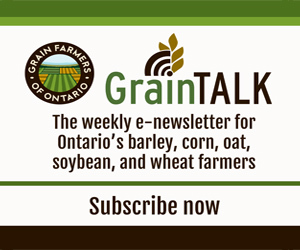 Go to www.ontariograinfarmer.ca to review all articles in the series.